Helen Smith of Sandy Creek High School has received the highest national honor bestowed to a graduating high school senior. She is one of the 160 high school students in the nation to be named a 2017 U.S. Presidential Scholar. Helen received the award in Career and Technical Education. 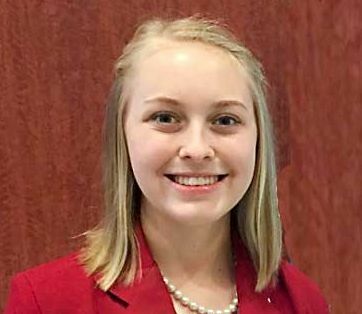 She is one of two students in Georgia selected for the honor in career and technical education, and one of four from the state to be named a U.S. Presidential Scholar. Smith is the only student from Fayette County who is a 2017 U.S. Presidential Scholar. The program was established in 1964 by Executive Order of the President to recognize some of the nation’s most distinguished graduating seniors for their accomplishments in many areas: academic success, leadership, and service to school and community. In 1979, it was expanded to recognize students who demonstrate exceptional scholarship and talent in the visual, creative, and performing arts. In 2015, the program was expanded once again to recognize students who demonstrate ability and accomplishment in career and technical fields. As a 2017 U.S. Presidential Scholar, Helen will receive the Presidential Scholars Medallion at a ceremony sponsored by the White House during the National Recognition Program (NRP) in Washington, DC. As a guest of the Commission, she will receive an expense-paid trip to Washington, D.C., and will attend a series of events held in her honor.